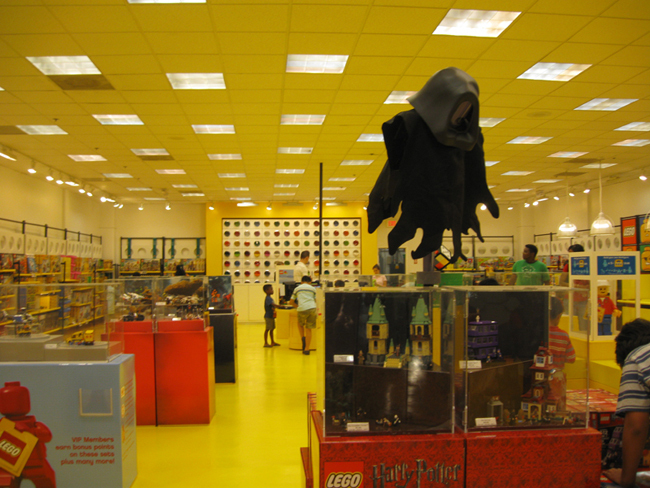 All the exciting events happening at the LEGO Store in July (in honor of the final Harry Potter movie) made me wish I was a kid. A few kids at Brickfair mentioned making wands at the store. I can only hope they were successful in driving away this giant LEGO Dementor! In a time where it seems the whole world is buying and playing with the Fire Brigade, the newest creator set, I have only just purchased my very first set of the series: Green Grocer. Yes, I’m several years behind the times. So what’s new? I’m poor and trying to save up for Infinitus. So sue me. Or, don’t, because I don’t have money. BUT the LEGO Store online cut its price $30 and after so many years of drooling over these sets, I decided I finally had to have one. The sets are more complex than anything else I’ve ever made, and they contain interesting things I’ve never thought of doing before. Plus the parts are really neat. I would have liked Cafe Corner too but I’m happy with this because the roof is perfect and I like the green bricks as well. The damage is unfortunate but the box is sealed and I guess this is why the bricks come in plastic bags, right? I also got my first Power Functions kit. I’m SO excited about this. I opened the box and immediately tried it out. The motor spins a LOT faster than I’d wanted, but I think it’ll work. I’m really, really, really excited about what I plan to do with it (see later in this post). I bought this because I wanted it for a project I have in mind and because the store online was doing free shipping for orders over $100, so it was perfect timing. And it arrived safe & sound. I also got a little minifig city set as a free bonus! Free LEGO? Um, of course I want! With some of the projects I have in mind, I’m going to need a lot of minifigs (excluding Harry Potter and castle, I have, like 10). So this is perfect and was a happy surprise. I realize to some people bonus LEGO in orders are probably commonplace or something, but it’s a big deal to me and makes me VERY happy I ordered what I did. Yay! Okay, so… my next big project is one I’ve had in mind for a year now. I’m calling it: Christmastime at Grimmauld Place! Yes, I’m planning on doing just one room with a revolving tree (and lights trained on it) with presents and some, er, things you might find in the crazy, old house. And then I’m planning on doing the hallway outside that room complete with (maybe) portrait of Mrs. Black (once I figure out how to do it- I’m debating some things) and house elf heads on the walls with santa hats on. Ohhh I’m so excited. God Rest Ye Merry Hippogriffs! I want to have it done before Christmas, while I’m still in the Christmas spirit.